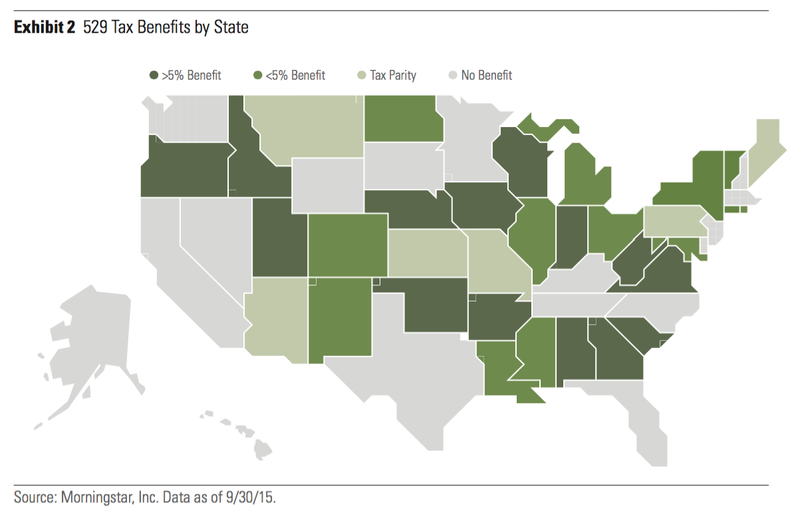 If your potential in-state tax benefit is greater than 5% of your contribution, then you should stick with your in-state plan. For example, if you contribution $100 a month ($1,200 annually), the tax benefit should be at least $60 to offset the chance that another state has a plan with slightly lower annual costs. If your potential in-state tax benefit is less than 5% of your contribution, then it is a close call. You should weigh various factors like relative fee amounts and quality of investment options. If your state does “tax parity” – meaning it offers the same tax benefits for any 529 plan – then you should (obviously) just choose the best nationwide plan. 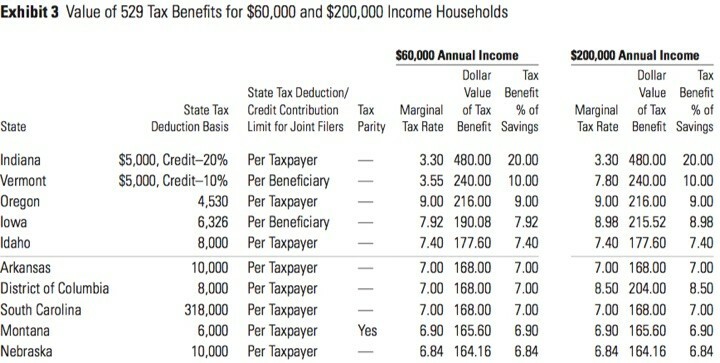 There is also a detailed chart provided that quantifies tax benefits for a hypothetical family saving for college (two adults, two children, $100 per month savings per child) at both the $60,000 and $200,000 household income levels. Here’s just the top 10 states ranked by biggest tax break, updated for 2015. Download the PDF for the full list. Keep in mind that many of the factors considered here are subject to change. State-specific tax breaks may come and go. 529 plan costs and investment options also change from year to year, with the overall trend being that the worst plans tend to get better due to competitive pressure. (No state wants to be the “worst” plan, and an expensive plan can switch administrators and transform into a cheap plan within a year.) Meanwhile, the top plans tend to stay that way. Therefore, I would perhaps lean towards grabbing any significant tax break that is available now and hope that the plan gets better in the future. Some states even let you grab the tax deduction and then immediately roll over the assets to any outside plan; other states “recapture” the tax deduction if do you that. Sometimes you can wait out the recapture period and then roll funds over to a better state 529 plan.